For many people, horse racing conjures up images of ostentatious hats, mint juleps, and wreaths of roses. But as The New York Times reported, a PETA investigation at two of the best-known racetracks in America—the famed Churchill Downs in Louisville (home of the Kentucky Derby) and the Saratoga Race Course in New York—revealed that for the horses, this “sport” has no glamour. They endure a miserable existence that includes drugs, exhaustion, electro-shocks, and injury and that all too often ends with an early death. PETA’s four-month-long investigation focused on the operations of Steve Asmussen, who runs the largest horse-racing outfit in the U.S. and has more wins than any other American trainer in the past decade. He also has the most extensive record of rule and drug violations of any current major U.S. trainer. Our investigator documented horses who were injected with drugs so that they could continue to run, despite suffering from painful injuries and conditions, such as having fluid in their joints and chipped bones. PETA’s investigator also saw evidence that horses’ legs had been burned with liquid nitrogen—a process called “freeze firing.” This procedure is purportedly used to stimulate blood flow to an injury so that horses can keep racing when they should be resting. Other horses were allegedly electro-shocked with concealed buzzers. One of Asmussen’s trainers joked that his top jockey was a “machine rider”—a nickname for riders who shock horses. Nehro, the horse who finished second in the 2011 Kentucky Derby, was forced to race on damaged, chronically painful hooves that were held together with filler and, in one case, with superglue. He was euthanized after an agonizing bout of colic last year on Kentucky Derby day. All this notoriety prompted immediate action and the first-ever real reform since racing’s drug culture began. 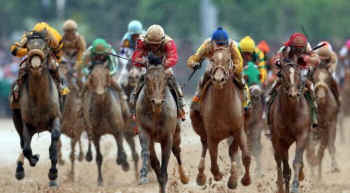 Nine state and federal investigations are now underway; Asmussen was removed as a nominee from the racing Hall of Fame; The Jockey Club reversed its decades-long position and backed legislation for federal drug intervention; California instituted new, stronger rules to eliminate electro-shock buzzers; strong security measures for two Kentucky Derby prep races were implemented, including surveillance and monitoring of veterinary records; the California Horse Racing Board banned thyroid medication; and much more. Following PETA’s investigation, we also met with the Canada-based Stronach Group, which owns major U.S. racetracks, including Pimlico Race Course, where the Preakness Stakes is held. As a result of our investigation, Stronach announced groundbreaking new reforms for all its tracks. Following our recommendations, the tracks will have the first-ever central pharmacies, which will be the only places on the tracks that dispense drugs. Trainers will not be allowed to have any other drugs in their possession. Other reforms included requirements that all veterinary records be reviewed and that horses shipped from other tracks undergo mandatory drug testing. Electric shock devices can no longer be used. And individuals found guilty of animal abuse will be banned from competing. Also in the wake of our investigation, dozens of prominent thoroughbred owners and trainers voluntarily pledged to turn over the vet records of all their horses entered in graded stakes races in Canada and the U.S.
And for one of the horses whom our investigator encountered, there was a happy ending. After hearing that the 5-year-old thoroughbred Valediction was being cobbled together to race again, despite recurring lameness, The Simpsons co-creator Sam Simon put up the funds to buy the horse. Valediction was transported to retirement on a farm in Virginia, where he’ll live out his life in peace and safety.